I love these two. 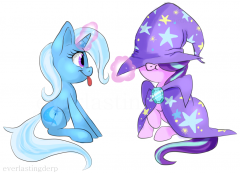 I'm not sure Trixie is great and powerful enough to levitate an entire p̶o̶n̶y̶ bunny in a hat though. I like to think she only managed it for a couple seconds before having to drop Starlight on the ground. Painted in FireAlpaca. Greatest Show Mare in all of Equestria! You all love her and you know it! I couldn't resist the socks, socks always adds to pony pics. Trixie totally didn't mean to do that, it was an accident, really! Filler at the top for the sketchbook page. 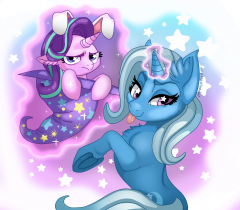 Yay alluring Trixie. I wondered about that image on here but felt less concerned when the adverts on the upload page were more risque. Hippogriff posted a blog entry in Are you listening to this? In other fandoms, remixes of theme songs, collaborations on popular artists, and even originals works by individuals can sometimes lack personality of the person who made it. In the pony fandom, anyone who has ever made a remix to a song that gets a few thousand clicks on YouTube, or someone who gets original work published on bandcamp, is automatically put into a long list of brony musicians. And for the most part, we all remember them. It makes me wonder if some day, some of the artists we thought were cool, or as cool as a YouTube account makes you, turns manestream and actually ends up doing something that the whole word can recognize, and not just bronies. My thinking is that it could very well happen, and sooner than most would think. Episode 5: Griffin the Brush-off https://soundcloud.com/jackle-app/griffin-village-winter-gilda Winter (Gilda) JackleApp Vocal Orchestral I'll admit, that I'm not usually the type of brony that responds well to tear jerking from media groups. I am, however, a fan of well-organized tellings of the story not heard. The story about the bad guys and their viewpoint of everything going on. A little perspective is all it takes to begin to understand why Gilda acted the way she did in the episode when she was rude to Rainbow Dash's friends. So let's picture it then. You're a griffon who went to a flight school, probably in Clousdale, and met Rainbow Dash, someone who would end up being a longtime friend and then to a friend who wasn't who you thought she was. And maybe, at the same time, Rainbow Dash had some growing up of her own to do, as she was still cool enough to enough fun flying times with Gilda, but lacking of the bad girl montage that Gilda would show whenever she acted with ponies she did not know. There is no excuse for being rude or mean, or steal, or frighten. And then again, maybe that's the griffin way. Thanks to Gilda, everything we know about griffins has been defined by the way she acted in this episode. JackleApp counters this thought with the idea that Gilda may not be such a bad girl after all, and is poorly understood. And if you disagree that Gilda deserves any sympathy whatsoever, then I will be watching your eyes very closely when we get to talking about Trixie. Episode 6: Boast Busters https://soundcloud.com/great-trixie/trixies-good-side Trixie's Good Side PinkiePieSwear Glitch You know, this is only minorly relevant, but new bronies now-a-days, probably see Trixie first on Equestria Daily before they do organically in the show. Hm. Interesting. Anyways, while we're not drifting too far away from redemption of villain characters, it's important to note that Trixie is the true queen of the redemption story, even before she got one, sorta. PinkiePieSwear, who became one of the earliest bronies to solidify his name into the fandom pool of names your should know, made a glitch remix of events of Boast Busters, and titled it her 'good side'. Not sure how that was possible, and even still, the song by itself doesn't really convince me that there is any redemption of her to be found. But the title of the song alone implies that this is what many people would have wanted. And they want to watch her and Twilight's interaction while it happened. Little did bronies know at the time that an episode was already in the writing stages and would eventually release in season 3. But I don't think it's over. There are so many angles Trixie's story can be turned that there will be near an infinit supply of fiction applied to the blue unicorn, both in story and in song. 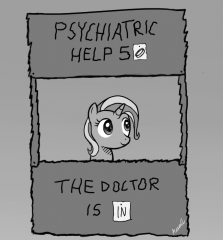 Don't worry, Trixie will help you out for the low price of five bits! ... What's that? Lemonade? I'm sorry, Trixie can't hear you over the sound of raining bits. Nice little distraction while studying, back to the grind as they say. 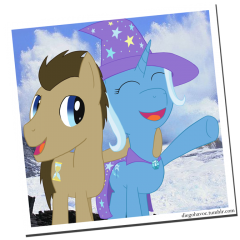 A picture Lyra took of her friends, The Doctor and Trixie, during an RP at Bridalbank Beach. She now has it framed and hung on her bedroom wall. This is the official thread for information and chatting about the fifth episode of season 3 - "Magic Duel"! Trixie is back and guess what pony she'll be gunning for? Oh you Twixie shippers will certainly have a ball with this one! So come join the conversation! The thread will open up five minutes before the episode airs (8:55am Central/9:55am Eastern). Remember though, there are spoilers in the comments section so read at your own risk if you haven't seen the episode! Trixie is here to rock your magical world! Pegasi were not fans of sudden, violent storms that broke over areas that were so lazily patrolled and controlled by the weather pegasi that the only difference between they and the storms over the Everfree lay in title alone. It seemed rude of the weather to do that, seeing as it was just so much simpler for them to be lazy and allow the pegasi to justify their lofty position atop the world. Pathfinder chuckled to herself through chattering teeth; that joke was a killer back in her schoolfilly days. She still found it funny too, mostly because for some reason a lot of her friends wanted to become weather pegasi. Well well well, school-age tormentors, who was laughing now?! As another fierce gust, driven in her mind by the sharp whip of lightning that split the sky above with a mighty and unforgiving crack followed by an enormous boom, slammed into her and sent Pathfinder flying around the sky haphazardly and with only the limpest form of control, she imagined that they were still the ones laughing. After all, they were probably back in Cloudsdale still dating all the cute colts and beautiful mares and living in their big cloud mansions and eating all that fine food and generally having an easy time of life. Of course they'd laugh because all they saw was an idiotic pegasus flying around in a storm when she could have used a few brain cells and been, well, anywhere else in the world. Then again that was why they were acutely lame and she was amazingly awesome. She wasn't just some stupid pegasus flying in a storm, she was Pathfinder, full-time adventurer and Daring Do Fan Club President, and she wasn't flying through a storm. She was powering through a storm, making it her little storm slave(even as another gust tossed her ruefully up in the air). She wasn't wandering aimlessly for no reason, because her aimless wandering had a definitive reason behind it. She was on an adventure, and that by its very nature made her life infinitely better than theirs. Whenever she made it back to Cloudsdale and tried to hang out around her old haunts, but was inevitably forced out because she was too old, she made it a point to bless her old friends and enemies and tormentors and bullies. After all, what better revenge than living well, what better way to live than by adventuring? The logic was perfect, even if the fools didn't recognize it. Or maybe it was because her beautiful pelt didn't match the old school photographs and she had to go through a ringer just to get in, making a mockery of it all according to those same stupid ponies? Ha, what foo- Pathfinder would have continued that train of thought, but another series of gusts sent her cascading around the sky like an out of control pinball. It ended almost as soon as it began, but Pathfinder knew she could take little more. She had improved by leaps and bounds over the past several months, but the lingering effects on her wings after the chemicals in The Pit were the sort of things a pegasus truly feared. Her wings were still weak and she had little stamina. Pathfinded started to glide down below, the air seeming to part for her as she landed with a near-silent thud, her form illuminated by an even sharper crack and flash than before. Luckily here the gusts couldn't steal her balance like they could her form above, which made the heavy rain collecting on the brim of her hat more bearable than it would have been otherwise. All in all, Pathfinder was happy to see the weather in this area fall completely and utterly out of any local pegasi's control and in the exciting world of weather gone mad, Pathfinder would find herself in a much better position. Still, she wasn't immune to catching a cold and her eyes scanned her surroundings. Heavily forested, though that came as no shock at all. She had to land in the densest part of the Whitetail Woods. It lacked the packed-in feeling of the Everfree Forest and it was obviously used with some leisure, but it was still a huge forest. If you got lost, you would remain lost for some time and all the proper placement of trees in Equestria wouldn't help you get out. That little fact also made getting good cover from the elements a bit harder as trees didn't overlap as often. And THAT little fact was why Pathfinder considered her adventurer's luck golden as she saw what appeared to be a crashed treehouse not fifty hoofesteps away. It had the form of some sort of living space on top of a platform, but both were broken to such a degree that Pathfinder found it hard to believe anything other than calamity had struck. Still, shelter of some kind was better than shelter of no kind, and Pathfinder started a healthy canter towards the structure close by. 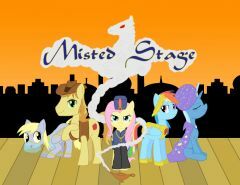 The cover image for a friend's fanfic: Misted Stage (FIMFiction link), an absolutely fantastic Arabian Nights inspired story. It has harem girl Derpy and Grand Vizier Fluttershy, what are you waiting for? Go read it. Now. Version 2 with white smoke. Introduction: OK, folks, I think I have a few ideas for fanfics! So, since this one seems the most interesting and has some great story potential, I decided to start this one. It takes place after the season 2 finale, but since I have yet to watch it, don't expect any references to it. However, if I see it before I finish, I might make some. Also, Discord is in this, but I'm using my theory: that Discord is actually Q from Star Trek: TNG, and he just took this chimera form because he knew it was easier for the ponies to accept than a human's. So don't be surprised if he mentions stuff from Star Trek. This story will be posted in parts. Prologue: In the Stone Prison Discord was never really defeated. Q never accepted that. "If I let them think they've won, I can take time to plan." he thought. "This was way more fun that teasing Jean-Luc, and certainly better than Janeway and Cisco. They're still children, in a way. And much more fun to corrupt." He turned himself into vapor and floated around Ponyville, looking for a viable target. Perhaps it would be a good idea to play from Satan's playbook. He always wanted to try that route. Chapter 1: The contract Trixie was in her carriage. Shows weren't paying nearly as much. "It's that blasted purple unicorn." she thought. "She's to blame. If those idiots hadn't awakened that Ursa Minor, I could still make good money." "Do you really think so?" a voice said. "Who's there?" she exclaimed. "For now, I'm not showing myself. It seems we have a common enemy. That purple unicorn defeated me as well. I could help you." "I'm listening. It could be fun." Trixie considered. "Yes. Fun." said the voice. [and this is where the opening credits would come in, if this were the show.] Chapter 2 to come on Sunday!